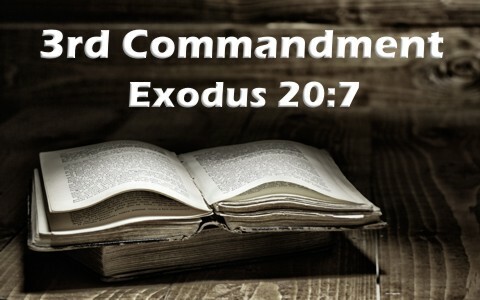 What Is The 3rd (Third) Commandment In The Bible? What is the Third Commandment? Can we still break it today? God’s laws are like guardrails on a dangerous mountain road and they protect us from running into the mountain or driving off the mountain so the Ten Commandments are not a lot of “do this” or “don’t’ do that” but “Do this or don’t do this so you don’t hurt yourself.” God, as a benevolent Father, wants to protect us, even from ourselves, and the Ten Commandments will do just that if obeyed. Nobody obeys them all but Christian’s strive to live by them. Jesus Christ says that it shows we love Him as He said, “If you love me, you will keep my commandments” (John 14:15). How important is obedience to God’s commands to Jesus? He states, “Whoever has my commandments and keeps them, he it is who loves me. And he who loves me will be loved by my Father, and I will love him and manifest myself to him” (John 14:21). Once again, Jesus equates keeping His commandments to proving to Him that you love Him. That’s the motivation behind the Ten Commandments, but of course they also make us run to the cross since we cannot possibly keep and thus, we need a Savior, but just because we can’t keep them, it doesn’t mean that we shouldn’t strive to do so. God has said He will not hold them guiltless who take His name in vain. It doesn’t matter to Him whether they do it accidentally or not. But what does that mean? Why is using His name in vain sin? The word “vain” in Hebrew (shav’) is precisely the same Hebrew word used in Exodus 20:7 and means “emptiness, vanity,” or “falsehood” so using God’s name in a careless or meaningless way is taking God’s Most Holy Name and using it as a curse word, swear word, or just casually. The Jews never dared break this commandment and were so careful that they didn’t even mention His old covenental name for fear they might mispronounce it. Even today, I have Jewish friends who spell God’s name as “G_d” because they know how sacred God’s name is. A Euphemism is substituting one word for another or actually, the substitution of a mild, inoffensive word for one that is. For example, someone might say “Fudge!” in place of a much more evil word that begins with “F,” or they might say “Gosh darn it” which is simply substituting “Gosh” for “God” and the “darn it” is in place of “damn it.” Even the phrase “Jeez” is the use of Jesus’ name and since Jesus is God, that is also using God’s name in vain and it is sin. We are reminded in the Third Commandment that “the Lord will not hold him guiltless who takes his name in vain” (Ex 20:7b). Those who argue that using euphemisms in place of God or Jesus’ name is not taking His name in vain but when someone uses these slangs, aren’t they using it meaninglessly or in an empty way? That’s just what this commandment forbids and yet, it is the most used language of the day, even from young children and God’s name is too holy to be used so carelessly. Since we know that the commandments are just, holy, and good, since they reflect the character of God, breaking them is equal to cosmic treason against the Most High. How do you think a king would like it if his subjects broke his law in a casual, customary fashion? You know he’d be incensed so how much more is God angered by the way His name is used in slang and profanity. The only time you hear Jesus name pronounced in public is as a form of disgust, like “Jesus Christ!” and that’s very serious to God. Jesus Himself said that at His return, “The Son of Man will send his angels, and they will gather out of his kingdom all causes of sin and all law-breakers” (Matt 13:41). Jesus was so angered by the Pharisees and the Scribes making their oral tradition equal to God’s laws that He said it was “in vain do they worship me, teaching as doctrines the commandments of men” (Matt 15:9). God’s commandments are so important to Him that keeping the commandments is an identifying mark of believers. Why else would the Apostle John write that “Here is a call for the endurance of the saints, those who keep the commandments of God and their faith in Jesus” (Rev 14:12) and notice that the saints keep the commandments of God and have faith in Christ. That’s the mark of a Christian. No wonder the enemy “went off to make war on the rest of her offspring (the church), on those who keep the commandments of God and hold to the testimony of Jesus” (Rev 12:17). If you think the Ten Commandments have been done away with or they were nailed to the cross, you don’t understand the law. The old Mosaic Law was full of oblations, rituals, washings, and animal sacrifices but Jesus perfectly fulfilled the once-and-for-all sacrifice that satisfied the wrath of God, once and for all. It was through Jesus that we gained access to the Father and now can speak (pray) directly to God. Before, we had been separated by our sins (Isaiah 59:2), but then Jesus became sin for us so that we might become the very righteousness of God (2 Cor 5:21). This should naturally make us want to live a life of obedience and that most certainly means we will not take God’s name in vain. Previous post: Why is The Mind of Christ Important to Believers?